When it comes to games, it always feels like a genre’s popularity is cyclical. If you were a PC gamer in the nineties, you probably couldn’t walk into your nearest retailer without being buried by the myriad of adventure games. Suddenly, they were completely out of vogue, the next big thing was real-time strategy and you couldn’t throw a stone without hitting the latest Starcraft knock-off. Then first-person shooters took off and we’ve been trying to get rid of the buggers ever since. By comparison, it seems like stealth has always just kept its head down and got on with it, but that’s not necessarily the case. Sure, titles will often come with an obligatory sneaking sequence that’s almost universally pants and is as welcome as waking up to find your dentist has taken a very keen interest in your kidneys, but they’re not proper stealth games. No, the true ones are fare like Metal Gear Solid and Thief (even the new one, if you’re feeling generous), which come along every few years, redefine the genre, then slink back into the shadows to prepare to do it all again. 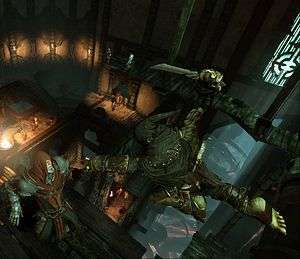 Aiming to join their ranks is the upcoming Styx: Master of Shadows, bought to you by Cyanide Studios and the director of Of Orcs and Men, to which this game acts a prequel. The story begins when a World-Tree first sprouts, leading the humans to build a giant atrium dedicated to housing it and protecting it from outsiders, preventing them from utilising the unique powers it holds. Players take on the mantle of Styx, the titular Master of Shadows, who is trying to sneak into the Tower of Akenash in order to both steal the heart of the tree and to discover more about his origins. Further information on the story is being kept under wraps and, to this end, we were shown a level that took place around the middle of the game. Although it seems as if the entirety of Styx takes place in the same location, that doesn’t mean that the levels are lacking in size. In fact, the chapter on display had a massively sprawling layout that took the best part of half an hour to overcome when taking what seemed like one of the most direct routes, although there are plenty of alternative paths to take throughout each level, depending on your play-style. Luckily, our hero has a ridiculous number of tricks up his sleeve to accommodate any tactics you want to utilise. For one, Styx can collect balls of sand and throw them at nearby torches in order to extinguish them; not only does it impact visibility, but guards will also attempt to re-light any unlit torches, allowing you a precious few seconds to either sneak by harmlessly or go in for the kill. The number of sand balls you can carry is limited and they can only be thrown a certain distance, but by exploring the environment the player can find opportunities to top up on their supply. Investigating the area is also a great way to discover not only new paths, but ways to hide in plain sight, as our hero can stuff himself in vases, boxes, and chests if he needs a quick hiding place. Taking temporary refuge in a nearby crate can also present the player with an opportunity to dispatch any patrolling guards by knocking them out and automatically pulling them in with you. Knocking out or avoiding guards aren’t the only ways to approach a situation, as there are plenty of more lethal solutions to get acquainted with as well. Straight up stabbing your foes comes in both loud and silent flavours, with the latter taking a good five seconds to pull off, which is more than enough time for anyone else to stumble upon the scene and render your sneaky efforts useless. If you don’t have time to move or hide a body, then help is at hand in the form of acid flasks, which can be poured over your recently felled foe, erasing any evidence that they were ever there. Much like the sand balls these items are limited, but aren’t as easily replenished, forcing you to think more carefully about where and when to use them. If stabbing isn’t always your forté, there are also occasional opportunities to use the environment against your enemies. At one point in the preview, Styx made his way over to some wine a guard was about to quaff, poisoned it, then waited for it to work its magic. Death by poison isn’t instantaneous and takes about seven seconds to work, so its use is best reserved for lone enemies, unless you’re feeling particularly confident. Later on in the level, our hero was able to get some humans to run under a set of hanging crates, at which point he promptly cut the ropes, squishing the people below. That trick isn’t quite possible to pull off alone and, to this end, Styx can create temporary clones of himself depending on how much amber he has access to. These duplicates are relatively harmless to enemies but are perfect for setting traps, leading humans to them, and stunning anyone long enough for you to either sneak past or take care of them yourself. Even better, if you force your clone to expire early, then it can explode in a cloud of black dust, allowing you further opportunities to get the drop on your foes. This isn’t the only ability that amber bestows upon our protagonist, as he can also use it to see through walls and track enemy patrol paths – although guards will occasionally change their routines if you take too long to deal with them – as well as turn invisible for a few seconds at a time, which could be vital difference between getting caught or getting away scot-free. 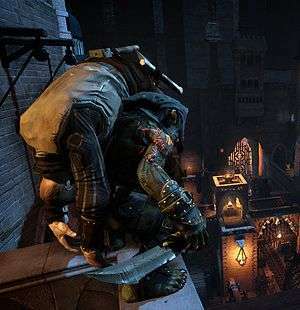 Should Styx ever find himself alerting the authorities, then it’s most prudent for players to find a way to escape; our hero can fight a single human one-on-one, but two or three at once will be completely overwhelming and tend to end in utter failure. Being seen isn’t the only way people will find you, as making too much noise can also result in your exposure. In fact, later enemies will come with their own ways to track you beyond the regular capabilities of humans. Elves, for example, will be able to smell your presence, while Roaches will make up for their lack of vision with a vastly improved sense of hearing, meaning making noise or smelling too badly could prove fatal for your efforts. This isn’t a game where just making it to the end will suffice for some players; to this end, Cyanide have made each chapter possible for players to speed-run, traverse non-lethally, or acquire the ever-coveted ‘ghost’ status for making it through a level without ever arousing an enemy’s suspicions or being seen. To add to the replayability, some of these tasks won’t be possible to complete in a single run, encouraging players to go back and play them over again until they’ve proven they’re the sneakiest, fastest, or most pacifistic. Add in a spate of collectibles and an average runtime of fifteen hours, and there’s plenty to appeal to the sneakiest of gamers. 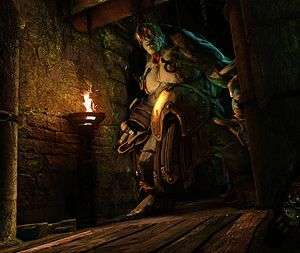 Whether it will prove itself to be the ideal alternative to Thief or the Metal Gear series remains to be seen, but until then, Styx: Master of Shadows is a surprisingly in-depth stealth game that should easily appeal to fans of the genre, while doing just enough to interest those who don’t eat, sleep, and breath sneaking. Hopefully, it’ll go against its sneaky instincts and attract plenty of attention when it releases later this year.